Morning is the toughest time for us to manage a decent breakfast. My Hubbin’ has to get up too darned early and get out the door and I get up early enough to take a morning walk and still be ready for work. There is barely enough time to cook food and pack lunches. I usually heat up some miso soup and eat it and then take whole grain cereal and lightly steamed veggies to work with me for Second Breakfast. Hubbin’s solution is to drop over to the local coffee shop and get his coffee and something to eat—NOT the best choice, no sireee. So I have endeavored to find sugar-free healthy grab n’ go foods for him to take along and eat with his coffee. I’ve gone two ways with this. One is to make a whole grain treat that is slightly sweet (using whole grain sweeteners) for him to nosh with coffee. He really likes my oatmeal cookies. Cookies for breakfast? Why not!!? It is whole grain, sweetened only with a little barley malt and a helluvalot better than some sugar-laden coffee cake or white flour bagel! Another thing I’ve made is Blueberry Coffeecake using Christina Pirello’s recipe here. That was pretty good, though it wasn’t exactly grab and go. It requires a utensil in order to eat it. This coffee cake was a bit too sweet but that didn’t stop us!. I grabbed a leftover quinoa dish. This happened to be quinoa with small pieces of roasted yams and some peas. It had dried out considerably and I knew I wouldn’t serve it again as is. I brought out my awesome double-burner grill pan to make these grab-n-go croquettes made from quinoa with corn, red pepper and mexican spices. So I quickly put together a little organic corn bread mix with some oil and almond milk. Skipped adding egg or any sweeteners at all. Instead I added minced onions leftover from making chilled cucumber fennel soup, some oregano and some celery seeds. I dumped in the quinoa and adjusted the dry cornbread mix so I ended up with a very thick batter. I spooned this onto a hot oiled cast iron pan and cooked the patties. I served them with slivered scallions and a dribble of shoyu (soy sauce). We both loved them!! 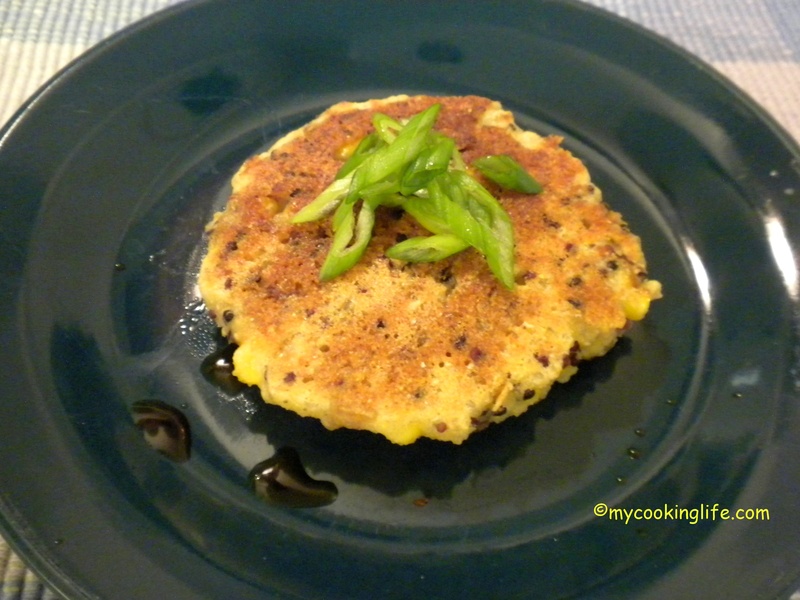 These savory little whole grain patties made great breakfast and we also ate them with a salad for lunch. They were perfect for grab n’ go because they held together just fine when you grabbed them! Endless combinations of leftover whole grains could be used here along with various seasonings.. It would be so easy to make your own cornbread mix with whole wheat pastry flour, corn meal, a pinch of salt, baking soda and baking powder. 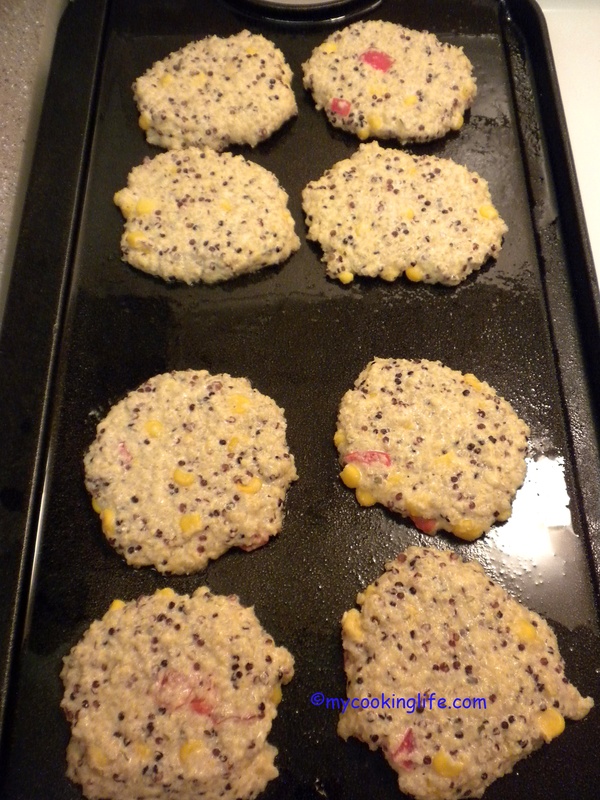 My quinoa patties were a big hit and they were gone in no time. So I made more for us and to photograph for you! I like to serve these with thinly sliced scallion and a drizzle of shoyu. This entry was posted in Cooking, Leftovers, Recipes and tagged blueberry coffee cake, leftovers, quick breakfasts, Quinoa, savory breakfast, sugar-free breakfast, whole grains by mycookinglifebypatty. Bookmark the permalink. This remains a problem for office goers all over the world. We do end up grabbing the wrong kind of foods in our hurry. To do something about it as you have done therefore deserves praise. Yum! You have the best ideas, Patty. This is something we would like VERY much! Thanks Kathy, and there’s no end to the variety you can create. Wow! Thanks Debra! And right back atcha!